This is one heck of a homemade chocolate bundt cake recipe from scratch. Moist, dense cake - not too sweet - and creamy delicious frosting. I call this cake "chocolate extreme" and it is better than a bakery cake. 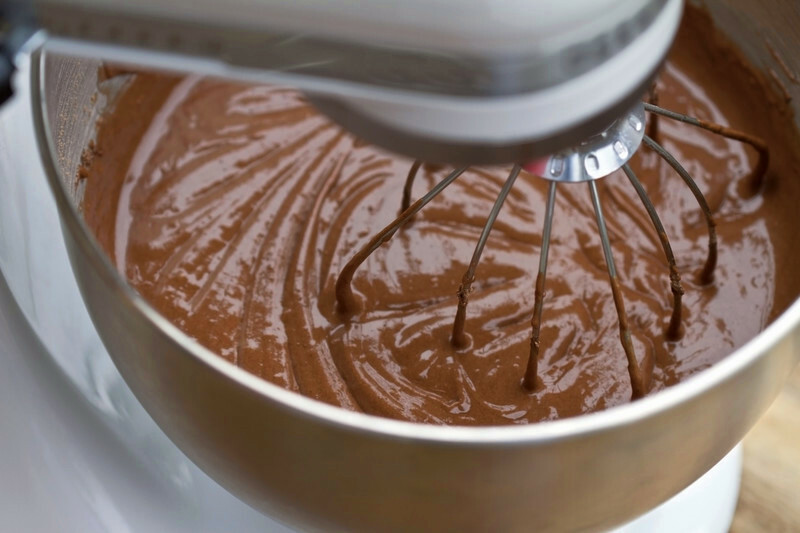 This is "chocolate lovin" on a fork..."
Don't worry about the thin consistency of the batter. This is made like a pudding (lava) cake, and it WILL bake into a normal (perfectly) textured cake; just exceptionally moist. I originally had the wrong cake pans listed for this wonderful recipe (thanks Jon! ), so if any of you had problems with overflow - that was why. Remember to place the cake pans on a baking sheet before it goes into the oven. If you are making your cake in a 9x13 pan, it needs to bake for 45 minutes. Now on to my chocolate bundt cake recipe. PREHEAT oven to 350 degrees. Grease and flour two 9 inch cake pans or 10" tube pan. Place parchment paper in the bottom of each cake pan; grease and flour the parchment paper also. In a medium bowl, stir together the sugar, flour, cocoa, baking soda, baking powder and salt. Whisk in the eggs, milk, oil and vanilla. Fold in the hot coffee by hand. Pour the batter evenly into the prepared pans approximately 2/3 full. This cake rises beautifully. Bake for 30 to 35 minutes in the preheated oven, until a toothpick inserted comes out clean (It may take a few minutes more depending on the depth of the pan). Cool for 10 minutes before removing from pans to cool completely. To make the frosting, cream butter until light and fluffy. Stir in the cocoa and confectioners' sugar alternately with the milk and vanilla. Beat to a spreading consistency. For this chocolate bundt cake recipe you may use a chocolate glaze (like I did in the picture above) instead of buttercream frosting. Mix well and pour over the cake just before its completely cool so the glaze soaks in.